This week the topic of conversation is – How can businesses use storytelling? 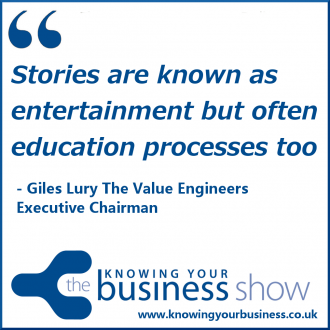 We ask Giles Lury The Value Engineers Executive Chairman his thoughts. What we found out was storytelling and business narratives are an effective communication strategy. And if you enjoy storytelling, you’ll enjoy the way Giles answered the questions in this most unique of interviews. The podcasts are available further down the page for your listening pleasure. Asking the all important questions is guest presenter Judy Mansfield. Show hosted by Ian Gentles. In addition, he contributes regularly to the media and is the proud father of four books: “Brandwatching”, “Adwatching”, “Researchwatching”, and the latest release ‘The Prisoner And The Penguin‘. Favourite workshop prop: One of his Lego watches. In this little 6 minute 57 second snippet Giles tell us his LEGO watch story. It’s rather good. This little 4 minute 29 second snippet Giles tells us the story of how The Value Engineers use storytelling in their job interviews. Fascinating. Giles explains in this 2 minute 44 second little snippet how a brand can become part of the narrative. In this case he talks about Richard Branson and the Virgin brand. Did you know this? This Knowing your business radio show was presented by Ian Gentles and guest presenter Judy Mansfield. The Knowing Your Business radio Show is broadcast every Thursday from 10am until 12 noon on Radio Horton. If you have any questions for Giles or would just like to leave a comment, please do.